The pink 2017-18 Economic Survey got the country talking about how gender equality should be as much of a policy priority as improving ease of doing business in India. Let’s take a look at a low-hanging fruit in this challenge: the digital gender divide. 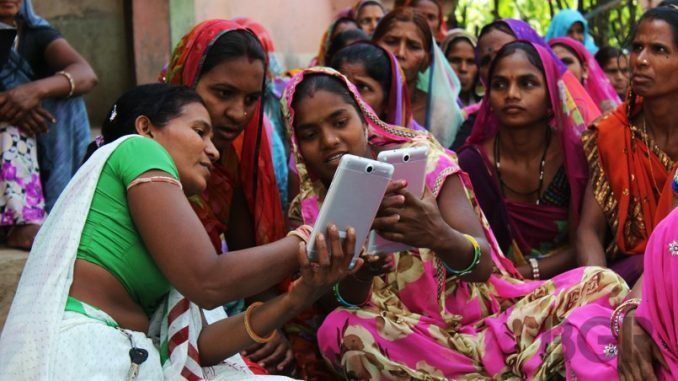 Bridging the gender gap in mobile ownership and digital literacy in both urban and rural India may increase the agency of women and help dismantle social norms that have been holding them back for decades. In fact, addressing the gender divide in digital literacy is perhaps necessary to ensure inequality of opportunity across gender does not widen in an India where the digital economy is expected to multiply by five times by 2023. There is a pressing policy question: what are the tangible benefits of closing the gender gap in digital literacy and mobile usage across urban and rural India? Insights can be found in the results of a randomized evaluation on mobile-enabled cash transfers by researchers affiliated to the Abdul Latif Jameel Poverty Action Lab (J-PAL). In the aftermath of a drought in Niger, female members of randomly selected households in 96 villages received an unconditional cash transfer. The researchers divided these households into three groups to measure the impact of three different methods of cash disbursement. One delivery channel distributed cash manually through envelopes. The second delivery channel distributed cash through an m-transfer system wherein households received an m-money (phone-based money transfer app) enabled mobile phone. A third channel distributed the cash manually but households were also given an m-money-enabled mobile phone. Since the division of households into the three different groups was randomized, the variation between the three groups at the end of the study can be attributed to the causal impact of the channel of distribution. Results show that households which received transfers via mobile phones saw a 10% improvement in diet diversity, a one-third increase in children’s meal consumption per day, and an increase in the cultivation of marginal crops that are primarily grown by women. The paper explains that the impact was a result of improved household bargaining power of the women beneficiaries. The mobile-transfer beneficiaries were more likely to obtain the transfer on their own as opposed to relying on their husbands, and more likely to travel to weekly markets and be involved in selling household grain than the manual cash transfer recipients. The key insight from this evaluation is that when women adopted mobile phone services to directly receive cash transfers, it increased their agency in household decision-making. Prioritizing digital literacy for women by combining mobile technology with the array of existing welfare programmes targeted at women can potentially lead to similar empowerment of women in rural India. Further evidence of the promise of digital inclusion for women can be found in another evaluation that took place in Kenya. The M-Pesa mobile money service has gained much traction in development circles in the past year, and understandably so. M-Pesa is a service that allows users to store monetary value on their phones and transfer to others via text message. An evaluation of the long-term impact of M-Pesa by researchers Tavneet Suri and William Jack suggests that access to M-Pesa has uplifted 2% of Kenya’s households out of poverty. The results are most compelling for female beneficiaries. Impact is driven by change in financial behaviour of these women, particularly saving behaviour, that has translated into their altering occupational choices by graduating from subsistence agriculture and multiple part-time jobs to business ownership. This could be a result of direct access to remittances through M-Pesa, and therefore, increased agency. This could also be because these women may have not been primary earning members in their households, and were constrained before they had access to mobile money. Vodafone India launched the M-Pesa platform in India in 2013 and has collaborated with the government and development sector to enable direct transfer of benefits in 10 states. Given the promise of the M-Pesa platform for female empowerment, especially across urban and rural contexts, targeting digital inclusion for female beneficiaries in rural India through the app could stimulate substantial empowerment for them. In a recent article, researchers Rohini Pande and Simone Schaner proposed the adoption of mobile phone-enabled check-ins for a conditional welfare programme. They present the hypothetical example of a scholarship for girls that is received only by those who can verify their attendance at school via phoned-in check-ins and informational calls. Integrating benefits targeted to the poorest women with mobile phones in this manner could be a promising way to plug leakages and make welfare programmes more effective. Digital inclusion can empower women not only through improving their individual agency, but also by dismantling hostile norms surrounding gender. Descriptive analysis of data indicates how mobile phones are correlated with different perceptions and behaviours around gender. A study on mobile phone ownership and usage by women in India, using 2004-2005 National Family Health Survey cross-sectional data, found that households where women had mobile phones reported lower tolerance for domestic violence and higher women’s autonomy in mobility and economic independence. India’s changing digital landscape is offering tremendous scope for women’s empowerment, and evidence from rigorous research suggests how mobile phone usage can transform women’s household agency and workforce participation. This calls for a greater effort to close the gender gap in digital literacy, and more innovation in integrating mobile phone usage with social welfare programmes. Without digital literacy, one of the most vulnerable sections of society, women from poor households, may end up in a situation where they are left too far behind to ever catch up with “Digital India”. There has never been a more pertinent time to bridge the gender digital divide. Policymakers, heed this call. Aditi Bhowmick is a research associate with J-PAL South Asia at IFMR.